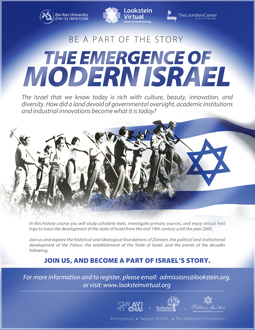 In this semester-long course, students will study the history of modern Israel from the rise of the modern Zionist movement to the present. 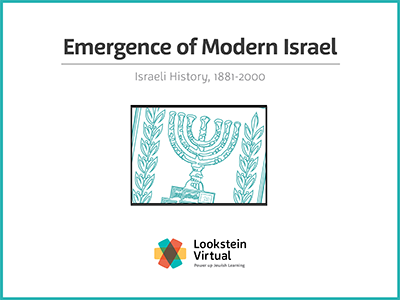 Following an exploration of the historical and ideological foundations of Zionism, students will trace the political and institutional development of the yishuv, the establishment of the State of Israel, and the events of the decades following. Issues discussed include the evolving Palestinian-Israeli and Arab-Israeli conflict, relationships with world powers, the political system, religion and society, the place of minorities in Israeli society, and the quest for Israeli identity. Through the study of scholarly texts, primary sources, and virtual field trips, the students will gain a richer understanding of modern Israeli history and its current position in international politics and the Jewish community. The Wide Spectrum of Zionist Thought: A step back to look at ideologies and leaders. The Early Years of Statehood: Massive aliyah, economic struggle, Knesset elections, Kastner and Eichmann Trials (1950s-1960s). Also: the political system, Israeli identity. 1970s: Munich/terrorism abroad, The Yom Kippur War, the rise of the Likud. Also: relationships with world powers. 1980s-2000: Lebanon War, Intifada, Oslo, Second Intifada. Issues in Contemporary Society: Religion and society, the place of minorities in Israeli society.